CHESHIRE, Conn. – All four CIAC high school football championship games will be streamed live this Saturday on the NFHS Network, and for the first time in Connecticut, the Class L and M championships will also stream live on Facebook through the NFHS Network Live Facebook page. The two CIAC games are part of 15 state high school football games to air on Facebook as part of the new partnership between the NFHS Network and Facebook. Already this fall Facebook Watch has featured NFHS Broadcasts of high school football tournament games from Georgia, California, Oklahoma, and Virginia. 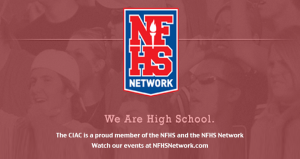 The NFHS Network has been the exclusive CIAC championship broadcast partner since fall 2012 and has streamed more than 500 CIAC tournament events during that time. The two games streamed on Facebook will be the Class L final between #5 Masuk and #2 Daniel Hand and the Class M championship featuring #6 Joel Barlow and #1 Killingly. The NFHS Network will have the exclusive broadcasts of the Class LL battle between #3 Darien and #1 Greenwich and the Class S showdown between #2 St. Joseph and #1 Ansonia. The broadcast links to all four championship games are provided below, along with a link to a CIAC-produced championship promo for media use if desired.